One of our favorite slow cooker meals, these Gluten-free French Dip Sandwiches make for a hearty, filling dinner! There are few things as satisfying as walking in the door at 4:30-5:00 and smelling a delicious dinner that has cooked all day in the CrockPot. It just puts me in a good mood! 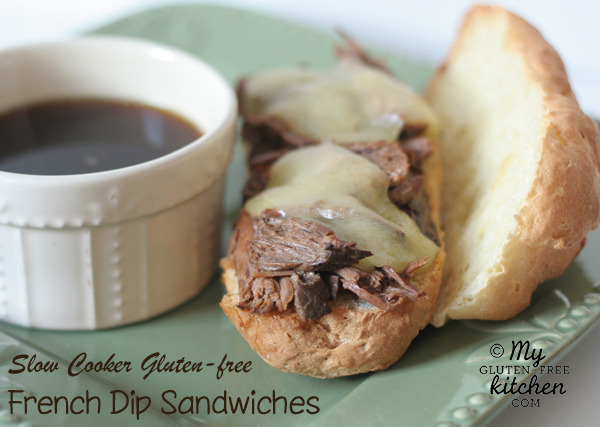 I love meals like these gluten-free French Dip sandwiches that are super easy to prepare and serve, taste great, and are hearty. I originally shared this recipe in April 2013, during my first 6 months of blogging! I’ve updated the pics, text, recommendations, and recipe a bit today! I don’t want you to miss this tried and true meal that my family devoured again last week! It’s always a hit with my family! This meal is also very freezer friendly. After we enjoy the meal one night for dinner, if we won’t be having leftovers the next night, I freeze the rest of the meat in the juices in a good Rubbermaid container. It reheats very well to enjoy another night, so really, you are getting TWO easy meals out of this! Everyone knows it can be a little more expensive to eat gluten-free. One of the ways I save money is by stocking up on meat when there is a good sale, and loading up my freezer full of it. I recently found a great sale on beef roasts and bought 3 for my freezer. I’m not really stuck on using a certain cut, but I always use boneless beef roasts: chuck roasts, rump roasts, bottom round, etc. 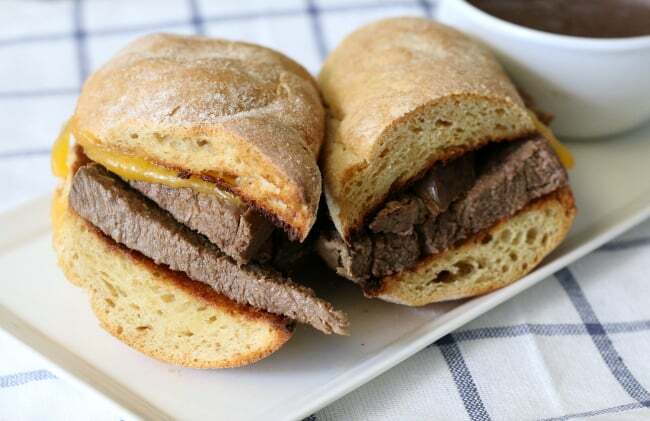 We already enjoyed one roast in our gluten-free Slow Cooker Pot Roast, and enjoyed a second roast in today’s yummy recipe for these gluten-free French Dip sandwiches. I’m thinking I’ll use the third roast to make shredded beef for tacos or enchiladas. Soy sauce: I always use San-J’s Gluten-free Tamari Sauce. It is certified gluten-free and easy to find in my area at regular grocery stores like Fred Meyer and Albertsons. If you can’t find it in your area, or you’d just like to buy a big jug of it, check out this 64 oz. Sam-J bottle on Amazon! Talk about stocking up! Beef bouillon: I use Herb-ox which is clearly labeled gluten-free. It is available as granules or cubes and I find it at my local Winco store, so it should be easy for you to find as well. You can also purchase Herb-on beef bouillon online at Amazon. Cheese: You can omit the cheese or use a dairy-free cheese like Daiya and this meal will be dairy-free! You are probably wondering about the gluten-free rolls to serve the french dip sandwiches on. If you have the pleasure of living near a gluten-free bakery, you might be able to pick up some fresh baked french bread, hoagie rolls, or even hamburger buns to use for these sandwiches. I’ve been so blessed that a gluten-free food truck opened up in nearby Boise, Idaho and they make and take orders for these awesome hoagies and hamburger buns too! No more making my own gluten-free rolls! These are amazingly good. If you’re nearby, make sure you check out Gluten Free Galaxy food truck in Boise, Idaho. Alternately, in the gluten-free freezer section of many stores, you can find several brands of pre-baked rolls or baguettes you can use, or you can even grab gluten-free hot dog buns. 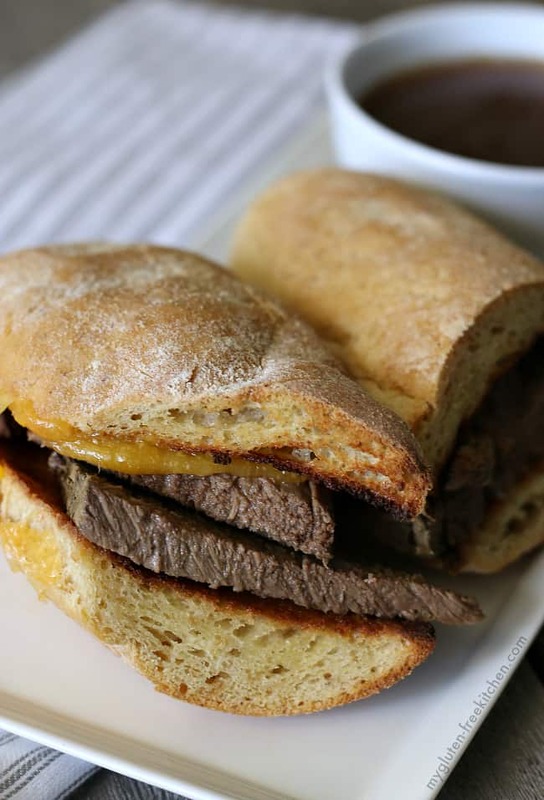 Wondering what to serve alongside your gluten-free French Dip sandwiches? I like to serve with a vegetable side dish, a fruit side dish like fruit salad, or something involving potatoes. This sour cream and cheddar mashed cauliflower would be a perfect side dish. If you happen to have a second slow cooker to use at the same time, you could make this Rudy’s Slow Cooker Creamed Corn recipe. I think my family would love this strawberry apple coleslaw recipe too! I love that it doesn’t have mayo since I’m not a fan of mayo! 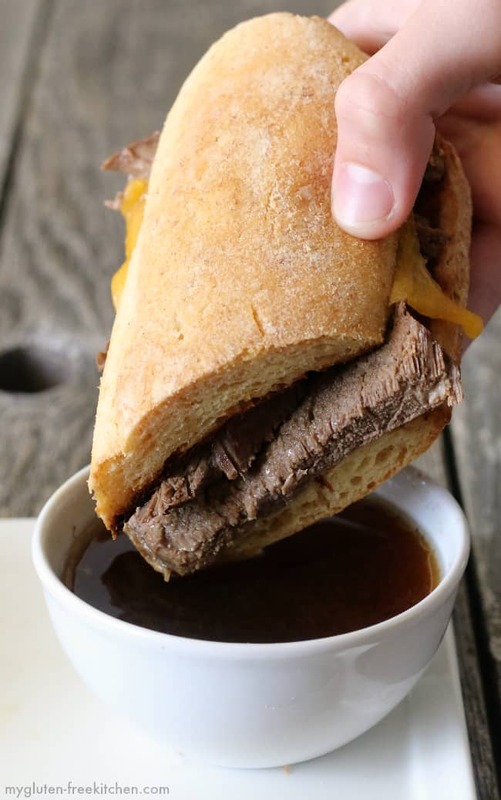 Served au jus, these French Dip sandwiches are so flavorful! If you have a picky eater that does not want to try eating the sandwich au jus, they might enjoy eating this as my youngest does: dipping it in ketchup! I guess it’s like a cheeseburger to him! I hope you’ll try these soon! A boneless beef roast slow cooks all day, yielding a tender roast and flavorful broth for dipping the sandwich in! Our family of 4 easily gets 2 full dinners out of this meal. Trim away extra fat from the outside of the roast. Place the trimmed roast in a slow cooker/CrockPot. In a 1 cup measuring glass, measure the 1/2 cup soy sauce. Stir the beef bouillon and garlic powder into the soy sauce. Pour the mixture over the roast. Using same measuring cup, add 3 cups of water to the slow cooker. Place lid on slow cooker and set to cook on LOW heat for 8-10 hours, or until meat is very tender. There is flexibility with timing, so set it for what works for your schedule! After cooking, remove the meat from the broth. Slice the meat with a knife if you prefer slices, or shred with two forks if you prefer shredded. Return sliced or shredded meat back to slow cooker and keep on warm setting until serving. Slice hoagie buns in half and lay cut side up on foil lined baking sheet. The foil is for easy clean-up! Brush each hoagie half with melted butter or non-dairy butter. Place in oven under hi broiler setting for 1-2 minutes, watching carefully, pulling out when edges start to brown. Top one side of each hoagie bun with thinly sliced cheese if desired. Return to oven on broiler setting for another 30-45 seconds or until cheese is melted but bun isn't burned. Remove from oven and add meat to hoagies. Spoon the broth from the slow cooker into ramekins or glass bowls for a dipping sauce (au jus). Enjoy! As always, be sure to double-check your ingredients for gluten. If you have a picky eater that doesn't prefer au jus, they might enjoy dipping their sandwich in ketchup instead! I haven’t had fresh dip sandwiches in so long! They used to be one of my favorites. yum! Thanks for leaving a comment, Melissa! I’m so glad your picky eaters loved these too – mine are the same about these sandwiches! P.S. I added the 5 star rating like you asked me too! I made this for dinner the other night and it was amazing!! The sauce is the perfect au jus!!! I’m so glad you all enjoyed it! We are having it tonight! What kind of bread is this in the picture? I am very excited to try some of your recipes. That’s what is in the photo here. I get 5 hoagie rolls from their French Bread recipe. Thank you so much for this recipe! Turned out great! We made this for company last night, and everyone loved it. Thanks for the great recipe!